Here it is: my first race report since saying goodbye to running in late July. 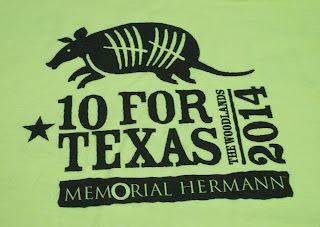 This past weekend, I participated in the 10 for Texas. 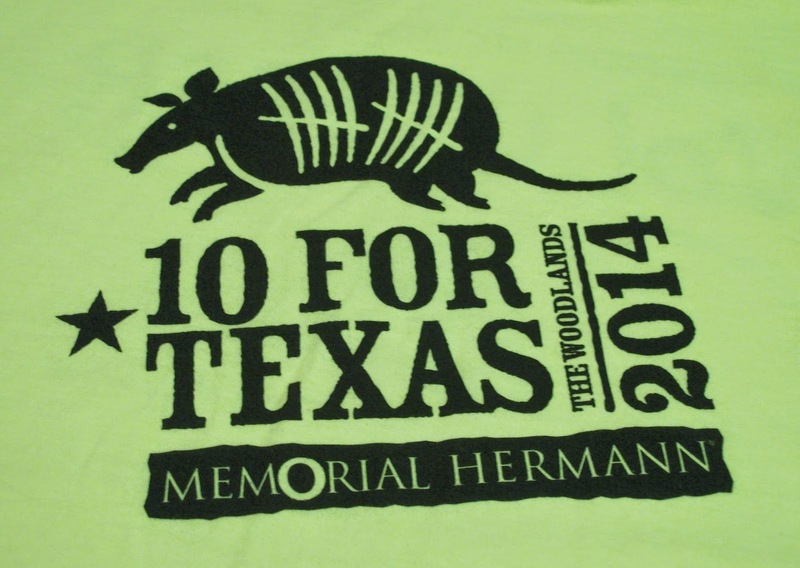 It’s a 10-mile race in The Woodlands, Texas, and it’s one of my favorites. I’ve run it twice before—until this weekend, my 2011 experience was the most memorable. Now, it’s a tossup. Soon another volunteer arrived, making my job easier. Now I didn’t even need to grab the bags—I just told Lauren, my new partner, the shirt size, and she found the bag and gave it to the runner. Pretty soon, I had to learn another line: “We’re so sorry, we’ve run out of Small shirts. You can choose a Medium or an Extra Small.” Lauren knew the drill—as soon as she spotted a bib that said “Small,” she grabbed two model shirts, tossed one to me and held up the other. “I’m holding a Medium shirt, and Lauren is holding an Extra Small. Which one would you like?” The runners were amazingly good sports about it, with very few showing any disappointment or annoyance. Runners are an easygoing bunch, I think. Hmm, I wonder why…is it possible that running could have positive effects on one’s mindset? I had a blast at packet pickup—the time flew. Lauren and I stayed until our host, the Luke’s Locker running store, locked its doors at 7:00 p.m. My surgically sliced abs performed well, and didn’t start barking at me until the fifth and final hour of my shift. I left the stored tired but happy. The tiredness was partly from being on my feet for 5 hours, but mostly from knowing I had to report to Hydration Station #3 at 6:30 a.m. It was dark, with hardly any traffic, when I parked my car on the grass verge of Lake Woodlands Drive. Our hydration station was in the median, at a crossover. It was an out-and-back course, so we would see the runners twice, about Miles 3.5 and 7. Maybe a dozen volunteers (I didn’t count) were assigned to the station. Most of us didn’t know each other, so we set to work making new friends. The race organizers clearly knew what they were doing, and had supplied us with everything we needed. There were eight tables, four or five Gatorade-filled coolers, and a big blue reservoir called a Water Monster. We had lots of cups, extra trash bags, rakes (to pick up the discarded cups), and three water pitchers (which would have been enough, if we had figured out our efficient water-pouring system at the beginning instead of the end). A plastic bin held bug spray, ponchos, band-aids, and other sundries. 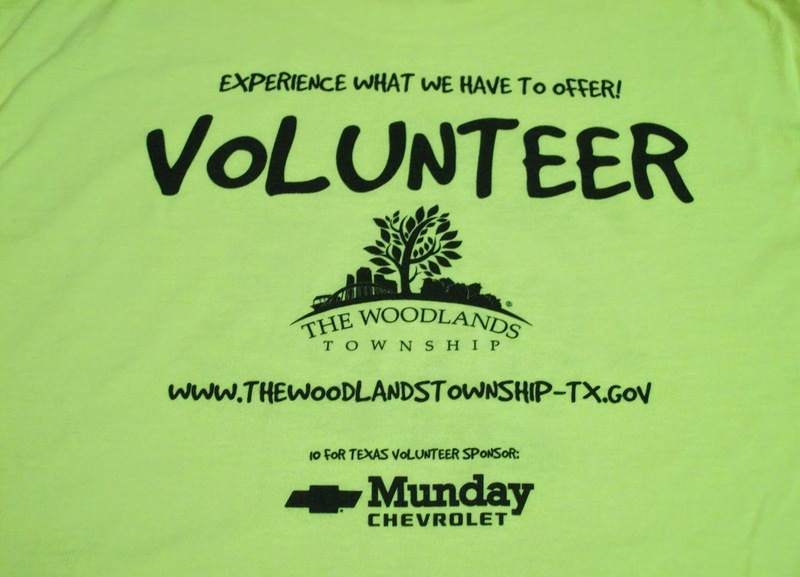 It also contained our bright yellow volunteer T-shirts, individually labeled with our names. 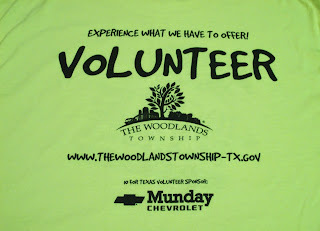 After a quick shirt switcheroo (under cover of darkness, behind a fellow volunteer’s SUV), we were ready to work. Before long, all the tables were covered with cups of Gatorade and water. We watched and waited, and finally saw our first runner! He was speeding along, and didn’t need anything from us. Others soon followed, until we had more than enough customers. We shouted “Gatorade! Water up ahead!” and “Water! Water!” At first, all went well. The cup-fillers were keeping up nicely with the cup-distributors. But then we got slammed—the runners were slurping the drinks faster than we could replenish them. I started out filling Gatorade cups, but soon switched to water, our more desperate need. It was crazy. We filled water cups furiously, but still couldn’t keep up. “Why did they only give us three pitchers?” Fill cups until pitcher runs out. Sprint to Water Monster. Wait impatiently for pitcher to fill. Tell Water Monster to hurry up. Get mad at Water Monster for obeying the laws of physics. Meanwhile, some unfilled cups are temporarily abandoned, risking that the cup-distributors mistakenly grab the empties and offer them to the runners. (It happened, I’m sure.) The cups were generally laid out by a separate person, so the pitcher-wielder could concentrate on pouring and refilling. But sometimes the cup-arranger had to stop and shove the full cups toward the street side of the table, so the cup-distributors wouldn’t grab the empties. Then the cup-arranging would fall behind. Eventually, we started to get traction. Our efforts were just as frenzied but not as futile. We were catching up. The improvement was mostly due to the slower runners being more spread out, but partly due to improvements in our processes. For example, I learned that I had been pouring all wrong. I had been tilting the pitcher down for each cup, then back up, then back down for the next cup. This wastes a ton of time. Instead, I needed to make sure all the cups were touching, then pour a whole line of them in one continuous motion, without lifting the pitcher. Who cares if the table gets wet? I wish I could take credit for figuring this out, but I learned it from another volunteer. I think she had worked water stops before, but maybe she was just a whole lot smarter than me. Yea, three college degrees, including one in engineering, and I can’t figure out the optimal way to pour water. Embarrassing. We didn’t get to breathe for long. We had survived the westbound rush, but now the eastbound rush was beginning. (It was an out-and-back course… the runners u-turned a couple miles down Lake Woodlands Drive.) This meant a do-over opportunity, and we hoped to redeem ourselves. The well-stocked tables on the eastbound side had been robbed during the earlier chaos, so we were starting from scratch. That was just fine, because we were improving by the minute. Our previous disorganization had gradually been replaced by efficient teamwork. One person “cupped,” covering the table with long straight rows of cups. Two of us poured continuous lines of cups, working from opposite sides of the table to avoid collisions. One guy did nothing but fill water pitchers. As soon as my pitcher emptied, he handed me a full one. Water Monster still obeyed the laws of physics, but moved faster, thanks to someone discovering that the hose-tap released a larger stream of water than the thumb-press spigots. (Easier on the thumbs, too.) Through proactive communication, we avoided the full/empty mixups: “Pull from Table 2!” Then the cup-distributors used Table 2 and left us alone. When Table 1 was 100% covered in filled cups, we shouted “Pull from Table 1,” and got to work on Table 2. It worked beautifully. After a while, we were well ahead and I finally had time to watch the race. I handed out a few cups of water and Gatorade, just to experience another aspect of volunteerhood. I am definitely not cut out to be a full-time cup-distributor. The task requires far more coordination than I possess—you have to hold a cup in your outstretched hand, and let it go at exactly the right time, without either dropping the drink or getting your hand tangled with the runner’s hand. Even trickier, you need to get in and out of position without tripping the runners or yourself. I managed okay with the slower runners, but when the leaders come through, I’d better stick to pouring water or cupping tables. The best cup-distributor in our crew was also the youngest. Well, she may not have been the most efficient, but she brought a smile to the most runners’ faces. She was a beautiful young lady, about eight or ten years old, and she distributed three cups at a time—one in each hand, and one balanced on her head. If she stood very still and the runner was coordinated and not too fast, it worked well. I hope she didn’t try it with the leaders. By this time, nearly all the work was done. The westbound (first) side of Hydration Station #3 had already been broken down, and the equipment was neatly stacked in the median. I didn’t even see it happen. One young man had raked cups for several blocks, all the way to the stop lights on either side of our crossover. He searched the bushes and pulled out every stray cup. The trash bags were filled, tied, and stacked. We cheered for the remaining runners, with an especially loud cheer for the last runner. With all of us helping, it took almost no time to clean up the eastbound side, rake the cups, stack the equipment, and empty the Water Monster. As an extra-special bonus on a special day, I got to say hello to my friend Fred, as he grabbed some water on his way to the finish line. Three years ago, I had the honor of running the first couple miles of the 10 for Texas with him. At that time, he was 83 and the oldest runner in the race. He’s still at it. What a marvelous morning. I was sad to see it end, and sad to say goodbye to my crewmates. Before the race started, I was determined to run the 10 for Texas next year. Now, I’d almost rather volunteer again, especially if it meant reuniting with my Hydration Station #3 team. Next year, we’ll know all the tricks from the get-go, and we’ll get it right the first time. Uh-oh…in my efforts to regain my running fitness, I think I may have made a grievous error (or narrowly avoided one, the data aren’t yet complete). Last night, my brother (who runs ultramarathons) reminded me of something I had forgotten—the 100% Rule. He said that most running experts agreed that a runner should not increase mileage by more than 100% per week. Hmm, I have some questions about this 100% rule. When the percentage increase is calculated, is it always based on the prior week? It seems more useful to base it on some sort of rolling average, perhaps the average of the four most recent weeks. Suppose I ran weekly mileages of 10, 14, 10, and 2. If I based my allowable 100% increase only on the most recent week, I could only run 4 miles, far short of what I logged just two weeks ago. On the other hand, if I average these four weeks, I get a mean mileage of 36/4 = 9 miles. A 100% increase would get me to 18 miles, which seems very reasonable. Surely the experts would agree, right? Another question: What if the prior weekly mileage (either for a given week, or for an average of several weeks) is 0? Then a 100% increase would put me at, well, 0. Even if the 100% rule were modified to something far more conservative (a 10% rule, for example), someone running 0 mileage could only increase it by … 0 miles per week. Thus, there is a natural consequence to any rule based on a maximum percentage increase: no non-runner can ever become a runner. To become a runner, one must be born running, or must break the rule. There are no other options. So, assuming the running experts actually want non-runners to become runners, there must be a mileage threshold below which the percentage increase rule does not apply. Rookie runners (or runners returning from injury- or dissertation-related layoffs) can dink around at the low end of the mileage continuum, until they reach the magic minimum mileage number—at that time, the 100% rule should be applied, to keep them from increasing mileage too quickly. and start limiting my mileage increases. My mileage for this week is 20 so far. Depending on whether I squeeze in another run this weekend, my next week’s mileage must not be allowed to exceed 40-48 miles. I’m so glad I was reminded of this rule! I have really been enjoying my return to running, and I don’t want to risk ruining it by injury. It is PhinisheD. Yep, somehow I finished my dissertation, defended it, and graduated. And I’m back! (on my blog, that is). To start, I must first apologize to my small but faithful cadre of readers. I should not have abandoned you. To write an (at least somewhat) inspirational blog post about the joy of spending Thanksgiving Day at McDonald’s, then to disappear without a word, for over six months—such behavior is unacceptable. Perhaps I can explain it, but I cannot justify it. No, scratch that….I cannot explain it, because I do not fully understand it myself. Words cannot describe the emotional, mental, and physical drain of my last four months of dissertating. (Keep in mind that “drain” is not always negative….intense joy can be draining too!) A few days after that Thanksgiving blog post, I set my dissertation defense date, for January 31, 2014. Driven by a fear of not finishing (two chapters had not been even begun, and the other chapters were extremely rough), I found myself able to work far longer and harder than should have been possible. Once the draft was “finished” (no more unwritten sections), I turned to revising, trying to bring the rough sections up to snuff, in hopes they would pass muster with my committee. I revised until I ran out of time, and then I sent it off—hoping for the best but fearing the worst. I knew my paper still had very real flaws, and I knew my committee had very real standards. However, I was unsure of the seriousness of the flaws relative to the standard. The process is rather like being in a dark tunnel and having to leap over an unseen rock wall, of unknown height. You know you need to jump high, but you don’t know how high. Until you jump, you don’t know what will happen—you might sail cleanly over the top; or you might hit the wall hard, hard enough to bruise and batter your body, and then fall back down the way you came. With luck, your head will not crack open and you’ll be able to try again another day. Or, you might jump almost high enough but not quite—just high enough to grab the top with your fingernails and somehow drag your body over the wall, scraping yourself up but successfully arriving on the other side. Somewhere in the process of finishing my dissertation, all my creative writing energy was drained away. It was as if someone opened a spigot and just let it all pour out onto the ground. Blog ideas used to constantly invade my brain. I didn’t always write them up, but I thought of them…sometimes I even started writing them, and stashed them in the archives for later polishing (nope, I still haven’t slain the perfectionism monster). But from November to March, no inspiration. It had been stolen away, maybe by physical exhaustion, maybe by the mental effort of writing, maybe by the intensity of emotion, from fear to overwhelming joy. I had no energy to do what I should have done—start writing in hopes inspiration would strike. After I cleared the Thesis Office in early March, I started to feel normal again and vowed to restart my blog. The problem was, that after such a long absence and after an event so momentous as a Ph.D. graduation, I was convinced my next blog post had to be SPECTACULAR. It had to engaging, inspiring, and beautifully written. Anything less would be a disappointment and might even out me as a fraud. I made a few token efforts, but they all fell short. Finally, I came to my senses and gave up. If my first blog post as a Ph.D. had to be good, my blog was doomed. I can’t let that happen. This little blog has been a creative outlet and a source of joy for me (plus, it’s great writing practice!)…. I’m not willing to let it go. Onward and forward… a new chapter in my blogging life awaits. P.S. Interestingly, I started this blog almost exactly three years ago, on June 22, 2011. I just missed my three-year anniversary. I thought of waiting three more days, until June 29, so this post could land on June 29, the anniversary of my first real post (rather than the intro post marking the existence of the blog). But I decided the risks were too great—if I suffered a perfectionism attack during those three days, my blog might sit idle for another six months. Better to strike now, while my courage holds.